THERE’S a ghost that haunts Artane, a part of Dublin where Ireland’s largest industrial school used to be. Schoolchildren there tell stories about “the blue boy”, who once came to a bad end at the school. Sadly, he wasn’t the only child who suffered there – and not the only one who died. The survivors carried away the baggage of their past – the physical and psychological injuries it inflicted – when they were finally able to put the school walls behind them. BrokenTalkers’ The Blue Boy tells their stories in a production combining text, sound, images and physical performance. Gary Keegan, co-artistic director of BrokenTalkers – together with director Feidlim Cannon – has a particular interest in this story. His grandfather, an undertaker, had been called into the school on several occasions to measure the body of a child who had died for his coffin. Sometimes, Keegan’s mother told him, he noticed bruises on the child’s body. When it was published in Ireland in 2009, the Ryan Report confirmed this story – and many others besides. Eleven years in the making, this report encompassed thousands of pages and confirmed the abuse of countless young children who, as social undesirables, were brought to these industrial schools and reformatories – which were the care and responsibility of the Catholic Church. This shed a particularly glaring light on the children’s suffering, rendering their torturers not only sadistic, but also hypocritical. Keegan and Cannon decided to make this the focus of a theatre piece. They not only read the Ryan Report but also interviewed dozens of former students of these schools. They were so shocked by what they heard it sometimes moved them to tears. Keegan and Cannon combined this and other stories – including Keegan’s own – with physical theatre into a unique production. Sombre images from the last century form the backdrop for masked performers to illustrate the children’s misery and desperation. 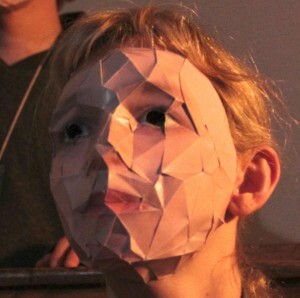 Wearing masks fractured into cubistic impressions of faces, they demonstrate the broken lives and souls of the children and indicate how their humanity was taken from them. “So much of what they had to do was work related,” says Keegan. “The environment was dehumanising. They all had a number as opposed to a name. They had to do a lot of marching. And when they weren’t marching or working, they were probably beaten.” The choreography and physicality of the work reflect this. Perhaps then even the Blue Boy can rest in peace.